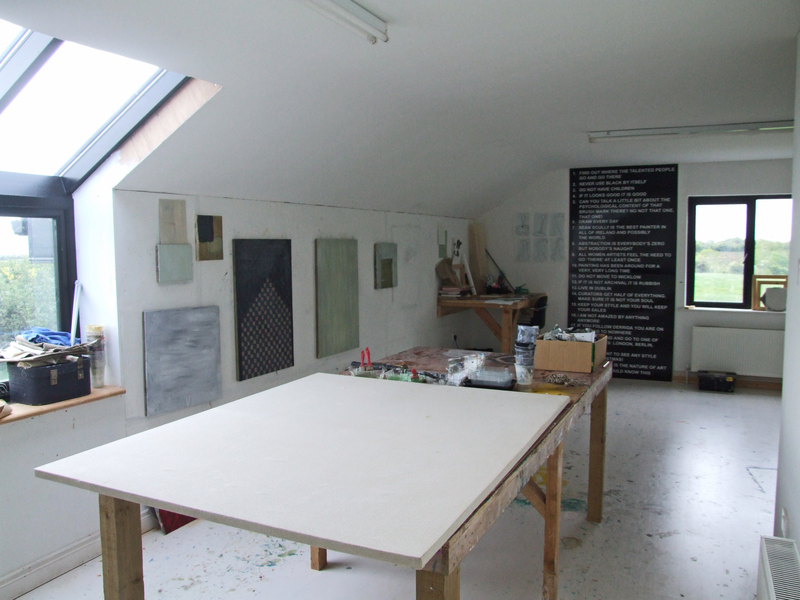 Emma Roche works from her purpose built studio at her home near Gorey in Co. Wexford. 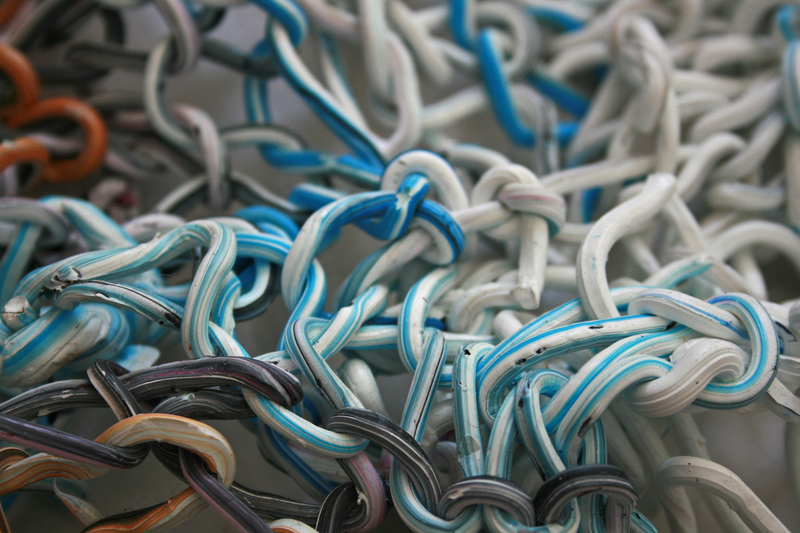 Emma describes herself as a painter but says that she does feel the need for a parallel of making work in the studio and the challenge of something else. This varies from being part of a reading group to doing performances to various other things that she feels are outside her comfort zone. This does not directly feed into her work but she does find that there is an indirect response in her paintings. 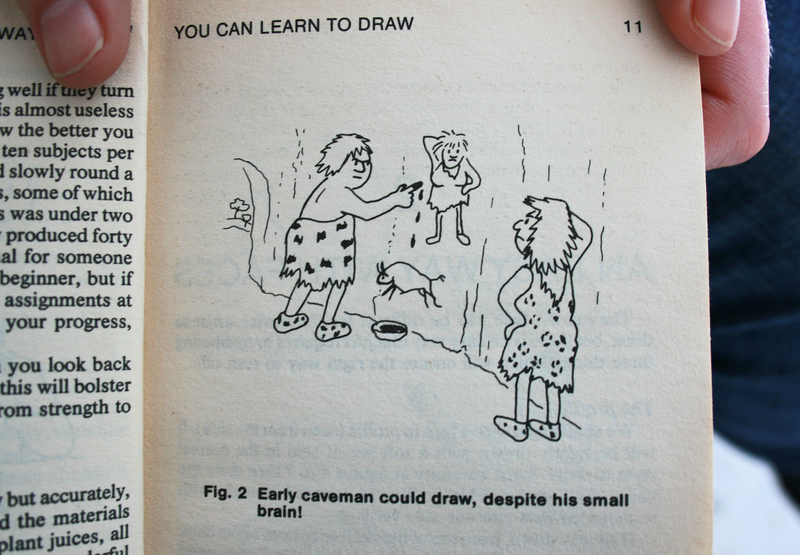 The book shows the reader the ‘right’ way to draw as opposed to the ‘wrong’ way. It appealed to her because of its prescriptive nature as it lays out such categorical rules that are to be followed. When I asked Emma about text-based research she told me that she recently re-read an interview between Marina Abramović and Laurie Anderson in which they talk about Abramović’s transition from painting to performance. It struck Emma that it was such a final and definitive decision and she was intrigued by the way she talks about her ‘final’ painting. Another text Emma returns to a lot is Frank Stella… and the Simulacrum by Peter Halley, written in 1986 for Flash Art. She is also interested in the writing of Jonathan Lasker and Liam Gillick. Although she reads a wide variety of texts, Emma said that, for her, texts are parallel to her work. She is conscious of the fact that a text can be incorporated into a painting that does not necessarily need it and feels that there can be a clash of two different languages. When a text is presented in parallel to a work or exhibition Emma believes that it can do something in its own right and work with what’s being shown instead of explaining everything about it. Having seen two performance pieces by Emma – ‘Art on the Balcony’ at the RDS and ‘Public Gesture’ in The LAB – where the process of the work was public, I asked her whether process as work or having a public process was important to her. Although she said that the processes in these two performances were not her processes she did say that the whole production of them was her assessment of something. They’re commenting on dumbing things down. This was especially prevalent in her performance in The LAB where she had built a home-made ‘factory’ in the exhibition space. Paint brushes connected to rotating handles were moved by a ‘factory worker’ and the result was a painting. In most of her work Emma is more interested in the viewer having the opportunity to try and guess the processes rather than her being prescriptive and saying ‘this is how I made the work’. 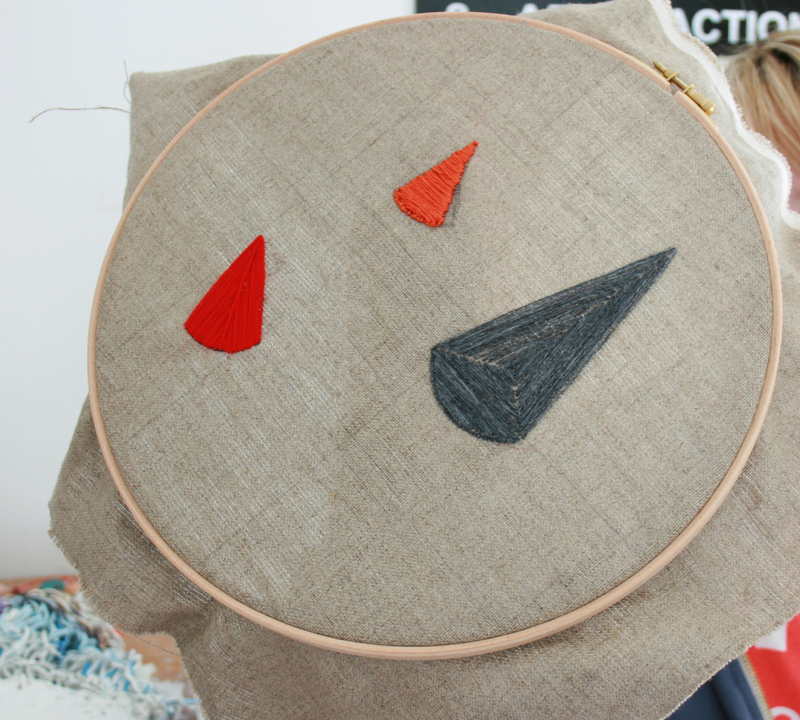 Although she doesn’t often make drawings, Emma has made a few pieces with thread on canvas. She describes them as drawings because they’re quick to make and she uses thread because she likes the haptic quality of it. To get a sense of how she works and the methods she uses, I asked Emma if she could talk me through one of her pieces and describe how it evolved. Stack 1 is the work that she described. The stack consists of 52 paintings stacked on top of one another and screwed together. It was made for a performance piece in the RDS at the end of 2009. The context of the stack was really important for Emma because it was at an art fair. On the balcony, above hundreds of paintings hanging on the wall waiting to be sold, stood this stack of discarded paintings that were screwed together in the process of being covered with paint. This was a real turning point in Emma’s work because she was saying goodbye to a lot of work that had been done up to this point. 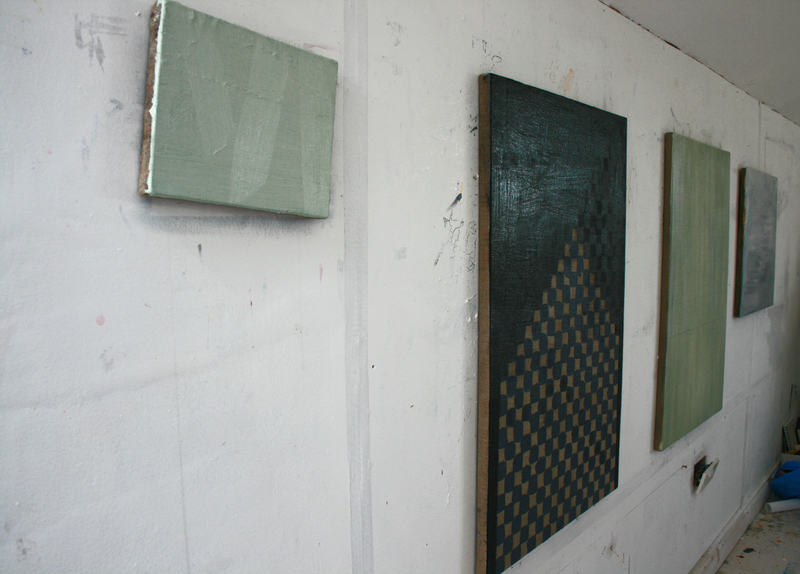 Half of the paintings in the stack had been made in a previous performance in the Lab and the other half were both finished and unfinished paintings from the studio. 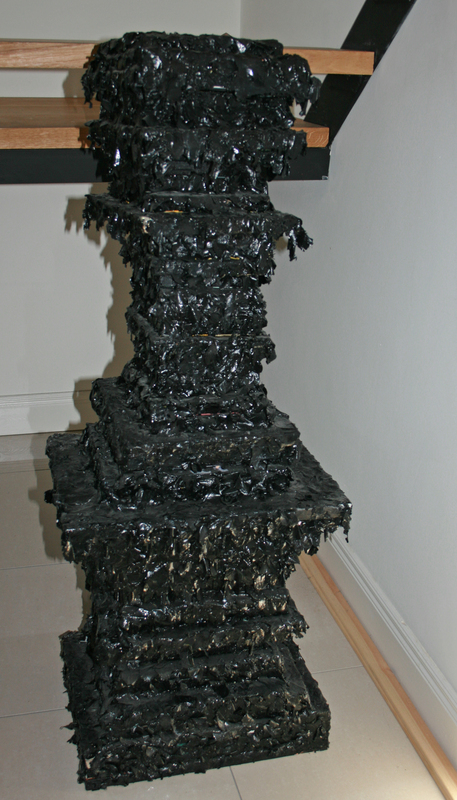 Brushstrokes of black paint that had been painted onto plastic bags and left to dry were then transferred to the stack to eventually completely cover it. Some people got angry when they saw this piece. Unaware that it was a performance, people shouted at Emma and said she was using too much paint and that it was a waste. Others were appalled that she wasn’t trying to sell her work, that she was ruining paintings that could have been sold. The fact that the art market had recently collapsed was obviously in people’s thoughts. In short, many people at the art fair thought Emma was slightly insane. At the moment Emma is not working towards any particular exhibition and is enjoying this because it comes with a certain freedom. It allows her to make work for the sake of the work and see where it takes her. She says that sometimes she finds making work for an exhibition to be destructive because she doesn’t necessarily have the time to figure the work out. However, she will come to a certain point when she feels she needs to show her work. Emma is a self-aware artist and acknowledges the fact that her explanations and research change all the time. She says that today her explanation may be about processes and putting them through some sort of ridicule and tomorrow it might be something totally different. She believes it’s healthy to realise that your thought process changes all the time. It’s never finished. Emma’s new website will up-and-running soon! All unnamed works are works in progress. 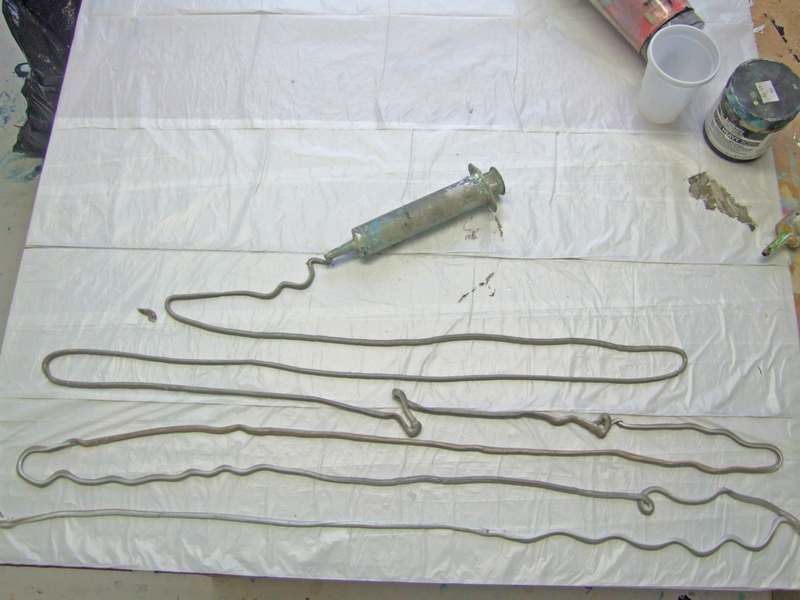 really nice blog, very considered writing and especially sensitive to Emma’s way of considering process in her art making. Really lovely stuff, cant wait to follow more! 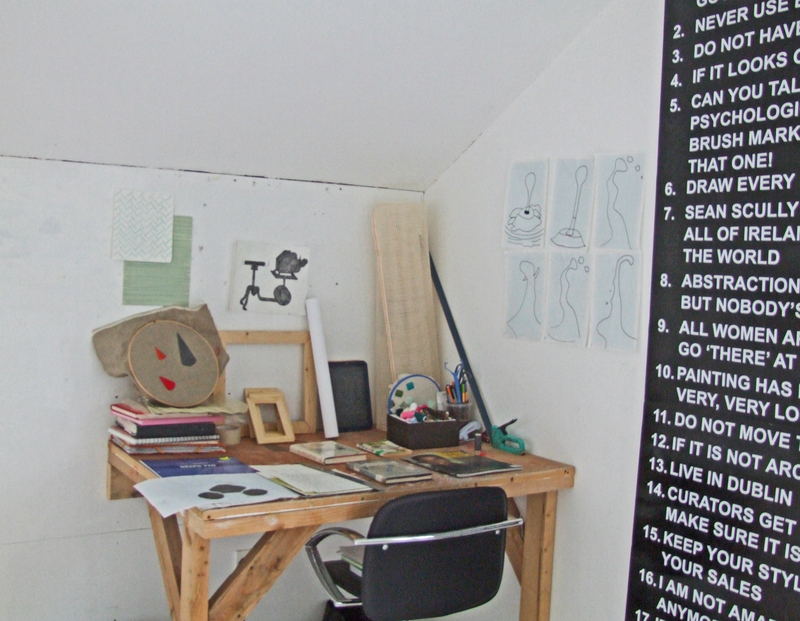 Very generous of Emma to allow the writer (and vicariously we, the readers)into her studio. I wish her the very best in the future with her practice. Fantastic – I never really feel I can fully appreciate the work that goes into an artists’ work without getting to see a bit of the studio! Thanks Emma! Nice reflective and honest perspective– great to see the art object and process taking precedence. The freedom to create and understand the work beyond the bounds of an exhibition- what a lovely idea. Great article! This is great! I read about it on VAI e-mailer – great idea. Congrats and keep me posted. Hi Emma I’m dipping my feet in the handcraft world again!! and am looking forward to seeing your website.